The highly anticipated book “Haunted Empire: Apple After Steve Jobs” hits newsstands on Tuesday, March 18. We previously had the author, former WSJ reporter Yukari Iwatani Kane, talk to us about the book but this past weekend we’ve managed to get hands-on with an early hardcover copy sent to us for review (we had already pre-ordered the book on Amazon.ca for our Kindle prior to receiving this review copy). What makes this book so special? Kane previously spent three years covering Apple for the Wall Street Journal (when Steve Jobs was CEO) and has put extensive research into the book, not only by speaking with 200 connections inside and outside the company—she traveled the world doing so. The book took her from Apple’s headquarters in Cupertino (the Apple vs Samsung trial is covered too) to Chicago, Boston, London, Frankfurt, Beijing, Hong Kong, Seoul and Tokyo. Research and interviews were even conducted in Robertsdale, Alabama—Apple CEO Tim Cook’s hometown. Other research for the book also came from news articles and books written not only in English but in Chinese, Korean and Japanese. Due in part to Kane’s exhaustive research and journalistic background, the book hits you with descriptive details that not only are easy to digest but also a joy to read. The book starts to dive into detail from the time Steve Jobs came back to Apple in 1997 and then jumps to 2008 onwards to present day. If you’ve read Walter Isaacson’s biography on Steve Jobs like I have, similar stories shared within Kane’s book shed insight from a different perspective and more details, such as the exclusive debut of the famous conversation between Joe Nocera from New York Times and and Steve Jobs. In New York, Simon & Shuster rushed out Isaacson’s biography a month early. Jobs had no control over the book’s content, but he had argued hard over the cover. In one of the initial versions, the publisher had proposed a cover with the Apple logo and Jobs’s picture. The title was “iSteve”. Jobs had been so infuriated that he threatened to withdraw his cooperation. Isaacson agreed to allow him input. As it turned out, he would have needed Jobs’s approval anyway because Apple owned the rights to every portrait of him that was any good. A few months before Jobs died, the two exchanged endless emails about the photo and the font that would grace the cover. Isaacson persuaded Jobs to go with a Fortune magazine photo from 2006 in which the CEO stares out intensely through his round glasses with a hint of mischief. When celebrity photographer Albert Watson had shot it, he had asked jobs to look 95 percent at the camera while thinking about the next project he had on the table. 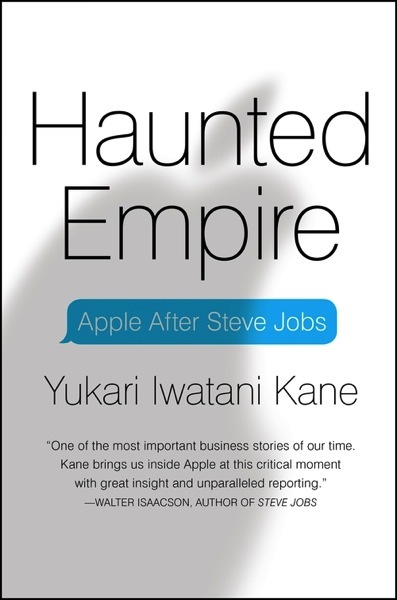 Kane explains Isaacson shared background details with her that did not make it into the Steve Jobs biography for Haunted Empire. Of course, the book is written in a way where Kane’s argument is Apple is not the same company without Steve Jobs and she tries to outline those changes within her book. It’s up to you to decide whether or not you agree with her. Should you buy this book? If you love Apple and want a post-Jobs look into the company based on documented research from a former WSJ reporter well known for her ‘scoops’ on the company, it is definitely one to consider on your bookshelf. Haunted Empire: Apple After Steve Jobs is available for pre-order in the iBookstore and Amazon.ca–it will debut on March 18.